Yup, another Nail Rock sticker day! I told you all about them yesterday, so I won't bore you with all of the details. I found Python to be slightly easier to work with than the Blue and Gold Stars from yesterday. I'm not sure if I just got better at applying them or if there was something better with the batch, but I felt like I didn't get quite as many wrinkles this time. The most common question I got asked while wearing these is, "What is that design on your nails?!" Some people thought they were eggs, but I had to disappoint them by telling them they were snake scales. Nonetheless, people thought they looked really awesome. Again, they won't last you anywhere near as long as the Sally Hansen polish strips, but they are still attractive. Have I mentioned that I may be going back to Cambodia? Yup, I've been talking to my boss about potential new projects for me and I may be going back in late April or early May. I'm excited, but I thought it was hot when I went in November. Well, it really was hot and humid, but apparently it's a lot worse in April. This time I will be bringing powder so I don't get heat rash! Well, I'll probably still get heat rash, but hopefully not as bad. You guys know I am terrible at nail art. Terrible. Luckily, for people like me, companies have been coming out with cool stickers or polish strips to get the art without the trouble. Nail Rock is a new company to me, and they apparently are sold online or at Nordstrom for $8. At first I thought they'd be like the Sally Hansen ones, but they aren't. They are actually stickers and are much thicker than the Sally's ones. To apply, I followed the directions from their website (see here), but as you can see, I still had some issues with wrinkling and uneven edges. I tried stretching them to get the wrinkles out, but they are too thick to move much. I also tried several different files to get the ends smooth with little success. I tried a glass Swissco file and the ones that come with the Sally Hansen kits. There are different sizes of stickers and I had no problem with them fitting my nails. On the bright side, I do like the design and how it looks from afar. I don't like how the end doesn't stick too well and starts to lift after a day. What do you think? Have you tried these? I broke a nail today so I'm spending the evening clipping and filing my nails. No worries, I'll be back to blogging tomorrow. On a different note, did you notice that there's almost 600 followers now? You guys are awesome and thanks for your continued support! Yup, I've finally been able to post my first magnetic polish. I'd like to say that they are really simple to use from the get go, but unfortunately I can't. It does take some getting used to, but the final effect is pretty cool. The Icing magnetic polishes have no names (I hate that) so I am just going to call it the dark blue polish. You apply 1 coat of polish (you can add more than 1 coat, but you must put the magnet over the wet polish) and wait at least 10 seconds with the magnet over the polish. I had some issues getting the magnet close enough without touching the polish so be very careful. The other issue I had was the wonky brush. I don't know why it was bent that way, but it made application difficult. Overall, I think it's a pretty cool effect, but I can see how this wouldn't be for everyone. You can find these at your local Icing store for $9.50, I think. Sorry for the late post, but I was out with some old graduate school buddies tonight. It's always so nice to see people you haven't seen for years. For the most part they always stay the same and that's awesome. I'm still sort of shocked that I didn't buy more of the China Glaze Let It Snow collection this past year. I usually get about half of the collection, but I guess nothing really called my name. I did purchase Champagne Bubbles at Ulta for $1.99 though. It is a metallic gold polish with small pieces of silver glitter thrown in there. The glitter is fairly subtle, but you can definitely see it in there. The application was pretty good, too. Sometimes metallics can get streaky, but I had no issues. Overall I'm pretty neutral on the polish. It's fine, but it doesn't blow me away. It's almost Friday! Yay! This is going to be a quick post because my favorite tv shows are on tonight. As promised, I have Pros and Bronze up for you this evening. It's a really interesting polish...sometimes it looks more gold and bronze, but if you tilt your nails a bit, the pink in there really becomes pronounced. I thought I was going to love this one a lot more than I actually did. I found the application to be a bit thin and sheer. You can still see some nail lines with 3 coats and definitely could have used a 4th (I got a bit lazy). I can't believe I'm saying this but I love the red polish a lot more than this one. It's a little known fact that I love tennis. I used to play in high school and would love to continue playing. Unfortunately I don't really know anyone to play with anymore, and I feel I would need a bit more practice before playing with a new group of people. While Serena Williams isn't my favorite player, I gotta give her love for her partnership with OPI. Love is a Racket is a bright red polish with subtle glitter in there (you have to look closely). I'm not always a fan of reds, but I think this one is fabulous! It applied like a dream and looks nice with my skintone. I found the Grand Slam duo at my local Ulta for $8.99 (for two polishes...I'll show Pros & Bronze tomorrow). Me gusta mucho! How is it only Tuesday? I had an extremely long day yesterday, so I guess that explains it. I was doing some DNA extractions on some bacteria the lab upstairs had available and it just took way longer than necessary. I mostly blame it on the centrifuges around here. Ugh. Enough science talk for all you non-science fans. I bought this Sephora polish when they were having their Friends & Family sale and I just needed a couple more dollars to bump me up to use the coupon. I mean, what else can you get for a couple bucks from Sephora? Not much, let me tell you. Jungle Playground is a pistachio green color with some nice microshimmer throughout. The bottle looked like it needed more shaking, but after attacking it for awhile, this is just how it looks. As you can see, it is much less yellow on the nail, but took a long time to dry, even with a quick dry topcoat. Other than the long dry time, I didn't have any major issues with application. It's SNOWING! Snowing! I really shouldn't be surprised because it had to happen at some point. How has the weather been in your neck of the woods? I actually got this Icing topcoat glitter (?) before I bought the magnetic polishes which I still haven't posted! I swear, I'll get to the magnetics after they aren't popular anymore. After Party is similar to the Color Club Covered in Diamonds polish where they are more like shredded flakes than glitter. Instead of just being one color, After Party is a rainbow of flakes. I like it, I think it is something fun and different for the nail. The same application issue applies for this one as it does for bar glitter. You don't want these flakes to get too close to the end of your nail or you'll have to yank them out because they are annoying. It isn't too densely packed so I ended up using 2 coats for the swatches. Is this something you're into? I just got done doing a little work out, and of course my feet fall asleep on the Precor elliptical machine. Ugh, I always try to move my feet around but it never helps. On a better note, congratulations to Marlee for winning our Pure Ice Giveaway! I've sent you an e-mail so be on the lookout for it. I will be having a new giveaway very soon (I promise!) and I think you guys will enjoy it. I love bar glitter. Love it. I know lots of people hate it, and I can understand their feelings. Save Me has loads of blue, orange and pink bar glitter (among some sparse other colors in there) with small silver glitter throughout. I've seen other blogs show it without being layered, so you definitely get it to be opaque on its own, but I like it layered. To each their own. The application was fine for a glitter, but you always have to be careful of getting the bar glitter too close to the end of the nail because it will sit over the end and be really annoying. This is the last one I have for the Nicki Minaj collection, and I am extremely happy with it as a whole! Don't forget, you still have one more day to win my Pure Ice giveaway! Please see the right side bar for more information. Grr, I just thought how I should have shown this polish tomorrow because it will be Friday. Oh well, this post is already started and I'm not going back. :-D Pink Friday is your bright Peptol Bismol pink creme that is pretty common, but I love it anyway. It has just enough pastel in it to stop it from being a neon (or vice versa). The application on this one was also pretty awesome despite the terrible mini brush I had to deal with. Overall, the cremes from this collection are winners. Did you guys watch the Grammy's on Sunday? Nicki Minaj and her bizarre performance continues to make me dislike her a bit. I know, I know, I shouldn't hate on her so much, lots of people love her. At least I can say that I love some of the polishes from her OPI collection! Can I just say how much I adore Fly? It is just a refreshing teal blue creme that unfortunately gave me a bit of the lobster hands. I love it, lobster hands and all! As you can see from the pictures, it is a bit darker on the nail than in the bottle. The application was fine as well-mini brush and all! Overall, I've got nothing bad to say about this one. It's Wednesday which means it's Criminal Minds night. I love the Matthew Gray Gubler (a.k.a. Dr. Reid)! Happy Valentine's Day! How was your day? 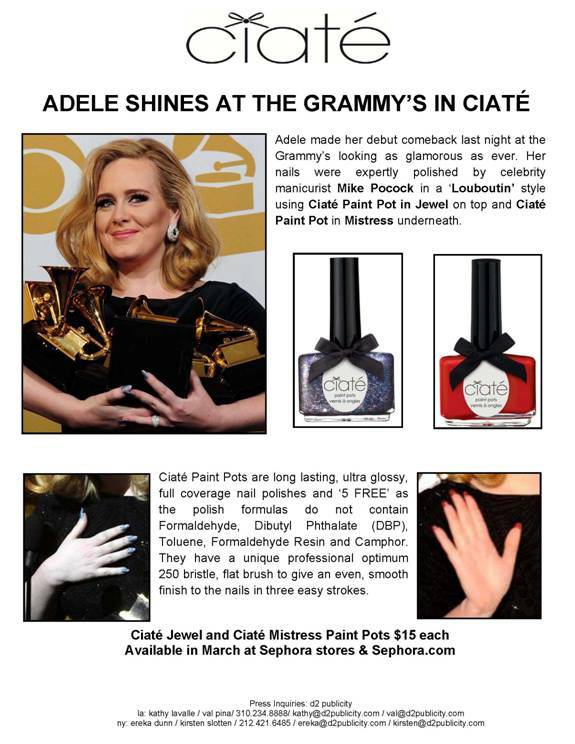 Did you like Adele's nails? Also, did you know that Ciate is coming to Sephora?! Who is this Lorelei and why does she have a tiara? Someone mentioned it's from the movie Gentlemen Prefer Blondes, but I've never seen it. My lovely sister-in-law got this one for me for Christmas and it's from the China Glaze Eye Candy collection. It's a silver based glitter with blue hexagonal glitter throughout. I think it's really beautiful! If you can't find this one at your Sally's Beauty Supply, you can still find it online or find the Sally Hansen dupe called Showgirl Chic. It was a little bit sheer and needed 3 coats, but applied fine. Hooray, it's Friday! Don't forget about the giveaway going on now. If you haven't entered yet, you still have plenty of time. I like to think that most of my swatches are true-to-life colors. There are always those rare ones just you just cannot capture correctly (*ahem* purples) and I had that problem with Julep's Hayden. The picture shown above is much more orange than it looks in real life. It's really a neon peach creme that is just really unique. I did have a bit of a problem with the application because it was quite thick and should have been thinned out before applying. As you can see above, thick coats can cause a little bubbling which is totally annoying. Well, that's it for tonight. I don't have many plans for this weekend...perhaps stop by the outlets I drive by every day to see if there's anything I need to have. What are your plans? I know, finally a new giveaway! I haven't had a chance to swatch these yet, but I figured that shouldn't stop me from giving them away (you will receive brand new bottles). To enter, please leave a comment to this post with your e-mail address. You must be a follower in order to win. And finally, this is only open to US readers (I'm so sorry to my international readers)! Please only 1 entry per person. A winner will be chosen by random on Friday, February 17, 2012. Good luck everyone!